The perfect cup of coffee is significantly affected by the choice of the espresso machine. This is why you should get informed about the advantages and disadvantages of different espresso machines. The market nowadays offers two types of these machines – the ones driven by a pump and the ones driven by steam. Before you make a decision about which type of machine you should buy, make sure to get to know more about both of them. In this article, we are showing you some of the crucial characteristics of each type, to help you make the right decision. We have observed three basic aspects, including taste, prices, and the mechanisms, and our conclusions about Steam vs Pump Espresso Machine are listed below. How Does the Type of Espresso Machine Affect Your Cup of Coffee? This is the most important question that we will answer for you since you will want to have a quality cup of espresso more than any other thing. In the world of baristas, it is a well-known fact that a number of steam machines (depending on the producer) may provide you both with the coffee that tastes a bit bitter than the coffee from a pump-driven machine. The espresso from this type of machine can also get you burned which is not surprising since the water in it tends to get really hot. To create the pressure required for a nice espresso shot to be made, the water in the machine should reach really high temperatures. Another important difference between steam and pump espresso machines is the fact that steam machine will probably never provide the same quality crema as the pump machine. Perfect crema should have a thick foamy texture and the steam machines usually cannot provide the layer as tick as the one produced by the pump machine. Finally, when it comes to the taste and the texture of espresso, the fact the pump-driven machines provide better quality is undeniable, which is one of the main reasons why numerous baristas go for this type of machines. If the steam espresso machines tend to provide lower quality, you may wonder why people still choose them over the pump machines. Well, the answer is actually pretty simple, and in a large number of cases – it is the price. Equipped with an airtight water reservoir, the espresso machine based on steam mechanism works by filling the reservoir with steam as the pressure increases and the water gets hotter. Once the pressure is adequate, the machine will give you a light signal that you can pull a shot or froth the milk. This is done by the steam wand. It is essential to pour the right amount of water into the reservoir, otherwise, the process will have to be performed from the beginning one more time. You should also be careful when using this type of espresso machine because of the hot steam that may get out when opening the water reservoir after you’ve used the machine. To provide the pressure required for an espresso shot, pump espresso machine uses a pump. First of all, the water should reach the right temperature for espresso to be brewed. Only then the pump will force the water through the grounds, and provide a perfect foam layer on the top of your cup. This machine is also popular because of the fact that the waiting time required for switching from frothing milk to brewing is significantly reduced when compared to a steam machine. Check out what’s good and bad features for steam and pump espresso makers. 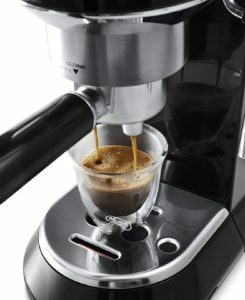 The biggest disadvantage of steam espresso machine is the fact that it tends to deliver espresso that has a kind of bitter taste, as well as the fact that it can never provide the pressure that will make a high-quality crema. In addition to this, you should be careful when handling it because of the hot steam that may get you burned. However, if you are not that much into details and you are willing to save some money, this machine may still be a nice solution for you. Apart from the fact it is definitely significantly more expensive than a steam machine, pump machine is also less compact – it requires more space, and sometimes it can be a bit more difficult to use, especially if you have no previous experience with the machines of his kind. Nevertheless, this is the machine that you should go for if you are willing to prepare a perfect cup of espresso with the high-quality crema. It prevents burning since it doesn’t require as high water temperature as a steam machine, and the time between brewing and steaming is reduced to a minimal level. You can find top quality pump espresso machine under $2000 or very good espresso makers for under 300 dollars. Depending on your budget, you will get proportionate quality. It’s very simple.